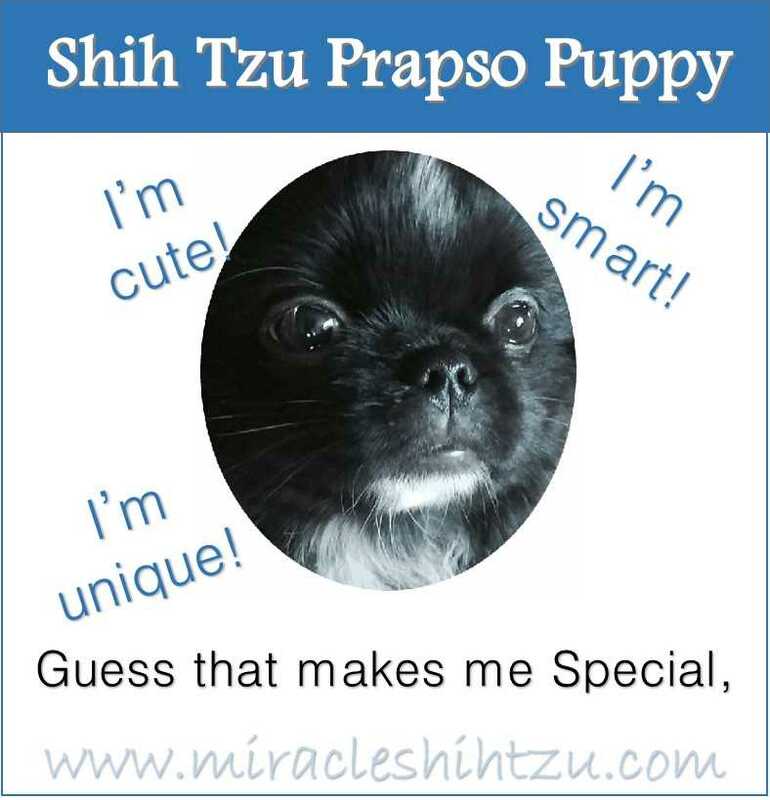 Shih Tzu Prapso Puppies: What are they? If Prapso puppies could talk, what do you think he might say? It is sad that dogs don’t know our language, but with a little effort we can certainly understand them through their body language. And, the Prapso is smart enough to get his point across without any words. 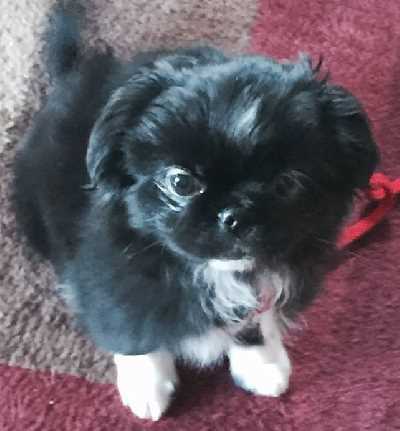 Not only did I learn just how unusual these puppies were, but I also discovered some interesting behavioral quirks that led me to believe they may be more intelligent than the average Shih Tzu. No don’t get me wrong, I think all Shih Tzu dogs are very smart. I don’t want to pass judgement, but the two Prapso Puppies that I had unexpectedly in a recent litter led me on a trail of discovery. 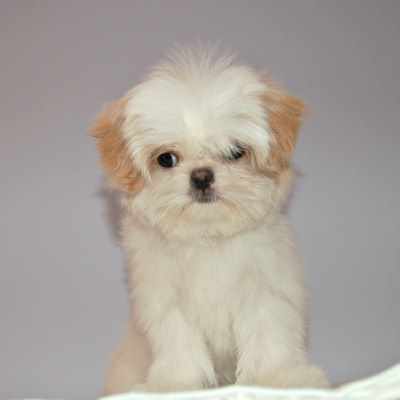 No one knows for sure where they come from, but they do pop up in purebred Shih Tzu litters from time to time. (I had been breeding four years before I got a glimpse of my first Prapso.) Unfortunately, at the time I had no idea what I was dealing with. Whether they arise from a genetic mutation or possess some ancient DNA that emerges occasionally is anyone’s guess. The old DNA theory seems plausible. Consider how the Shih Tzu breed was developed. In ancient Tibet and China, when the breed was first developed, no written records were kept of which dogs were bred to each other. Many of the small Asian breeds have some similarities and thus probably a share of each other’s DNA: Lhasa Apso, Shih Tzu, Pekingese, Pug, Tibetan Spaniel, Japanese Chin. All are very unique today, but various genes from these breeds could have become part of the Shih Tzu at some point. Whether the Prapso has retained some of the little Pekingese DNA that exists, or some of the most ancient DNA no one knows. Again, it could also just be a fluke—a genetic mutation. Also, there is another, now extinct dog breed called the Happa or Chinese Happa. 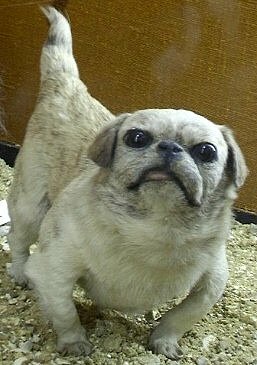 It resembles the Pug, but it too could have contributed his genes. In modern times, The Shih Tzu was developed from just fourteen individual dogs, seven female and seven male dogs. During the Cultural Revolution in China, the breed was at a point where it might have become extinct if it were not for several individuals who managed to obtain a few remaining dogs and export them to Europe. One more dog, a Pekingese was added to the mix before the stud books were closed. It is believed that the name Prapso came from Australia. It was known that Prapso puppies can exist in the Lhasa Apso breed. It is likely that the name came from the “apso” in Lhasa Apso. They have a definite look that is different from the Shih Tzu breed even though they are purebred Shih Tzu dogs. All Shih Tzu have a double coat, soft inner coat and a harder outer coat. The Prapso has a single coat. Many Shih Tzu dogs have hair that has the potential to grow to the ground if properly cared for. This trait is necessary if one wants to show their dog in Conformation. This thick profuse hair coat is prized and is what sets the breed apart. Not all Shih Tzu dogs have such a thick coat. There is a wide variation in thickness and texture in the Shih Tzu Breed, with prized Champion Shih Tzu having the thickest coats. However, Prapso Puppies will never have such thick long hair. Their hair will only grow so far and then stop growing, similar to that of the Japanese Chin. This particular trait is very attractive to people who love the personalities of their Shih Tzu dogs, but don’t always have the time or desire to groom them properly. Many Prapso owners will call them the “No-Groom Shih Tzu” because of the ease in keeping them looking great. The most noticeable feature of the Prapso puppy is the lack of facial hair. The normal Shih Tzu puppy’s facial hair will grow out in all directions resembling the petals of a chrysanthemum flower. This is noticeable by about seven weeks old. The difference between normal Shih Tzu puppies and their Prapso brothers and sisters begins to show by six or seven weeks of age. By eight weeks of age, a normal Shih Tzu puppy has hair that often hides the eyes. Eyes are still clearly visible by eight weeks in a Prapso Puppy. Beyond the physical differences, I also noticed some developmental issues worth noting. Many Prapso owners report that their dogs are very smart—learn quickly and develop faster than their non-Prapso siblings. I noticed this difference, also. The two Prapso puppies in my litter seemed a little more advanced than the others. For example, one Prapso puppy whose name was Angel managed to crawl out of the whelping box before any of the others. He did this in the first week of life. He also walked before the others, managed to eat solid food first without any help, and was the first to run. Whether his physical development makes him smarter is yet to be seen. Behaviorally, he seemed to be the same as other puppies except for one thing. He discovered toys before anyone else in the litter. His favorite game was to grab something and prance away with it. Now, before you say to yourself, all puppies do that, let me just tell you that he was doing it at three weeks of age. This is long before many Shih Tzu puppies have enough strength to walk on all fours without stumbling and falling. Later, his owners reported that he was playing fetch soon after arriving at his new home. Now, “Fetch” is a fun game that dog owners enjoy playing with their canine friend. Shih Tzu dogs, however, have a very low prey-drive, making the game nearly impossible to most Shih Tzu dogs. Rather, the Tzu will watch you throw an object and then wait and watch as you retrieve it. Not much fun for the average dog owner. 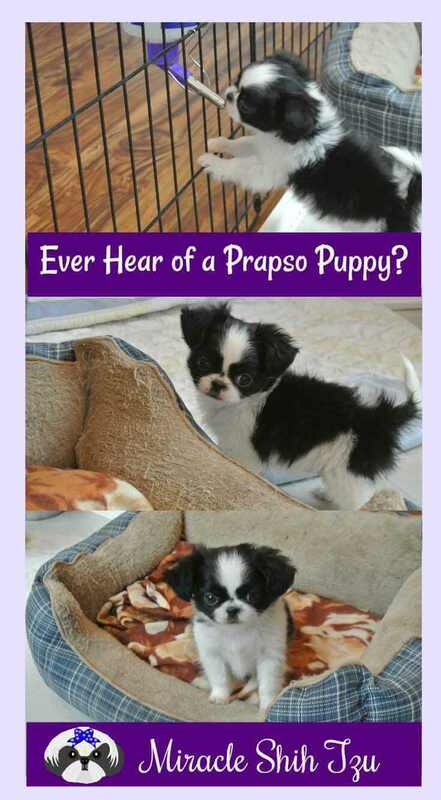 There does not seem to be any health issues associated with the Prapso puppy. I checked the veterinary literature and could find nothing. I asked two vets and neither had heard of the term. All Shih Tzu dogs like any other breed have some genetic conditions that have been reported such as eye problems, hip and knee issues and reproductive problems among others. There is no breed that is 100% healthy. The good news is that Prapso puppies enjoy the same long lifespan as any other Shih Tzu and tend to be very healthy throughout their life. I doubt that few breeders deliberately try to breed for Prapso Puppies but those that are born are just as precious, healthy and cute as the more normal looking Shih Tzu. They would never win in a Conformation competition but then again most pet quality Shih Tzu would not win either. Most breeders who have produced a Prapso will not repeat the same breeding. But as long as either the Dam or Sire have had previous healthy litters, there is no reason not to use either one again. It would be ill-advised to repeat the same mating, though, unless a Prapso is what you are hoping to achieve. For those who love the Velcro quality of the Shih Tzu personality, the cute stubborn streak, the loyalty, playfulness and love that these dogs offer minus the long hours of grooming, a Prapso puppy might be just the thing. But if you are waiting for one, it will be a long process because as of this writing, this breeder has not figured out how to produce them deliberately. Do you Have a Prapso? Thinking About Getting One? We'd love to hear your experiences. Tell us about your Prapso. Minnie, the One in a Billion Dog!